In ancient times, there were three species of gazelle in Saudi Arabia: the Mountain Gazelle, the Saudi Gazelle, now extinct, and the Sand Gazelle. Gazelles were once much more abundant on the Arabian Peninsula, but the combination of hunting and overgrazing by livestock have greatly depleted their numbers, leaving only small relict populations. Gazelles are small antelopes with delicate faces and short muzzles. Both sexes typically have horns, although the females may have small, malformed ones or none at all. 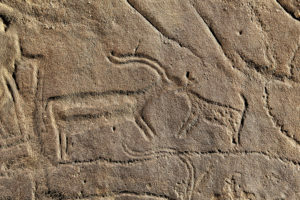 In the Neolithic, gazelles were hunted with great frequency in the Near East and the Arabian Peninsula. One successful method involved the use of “kites,” enormous stone-lined avenues that terminate in a corral, where large herds were driven to be slaughtered. They are called kites because of their appearance from the air. Kites were still employed for hunting gazelles up to the beginning of the 20th century. 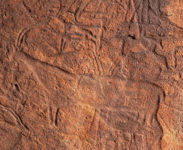 Gazelles are some of the most frequently depicted animals in Saudi petroglyphs, particularly in the Neolithic art. They are usually shown individually, sometimes being attacked by dogs or hunted by a bow-hunter. Of the three Saudi species, the Mountain Gazelle is the medium-sized one. It has distinct facial markings, a side stripe, and long limbs. Although both sexes have horns, those of the female are smaller and sometimes malformed. 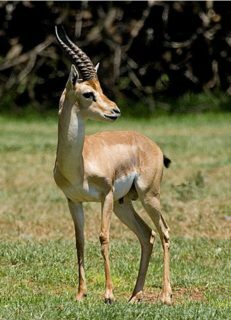 The Mountain Gazelle resides in mountains, foothills, and coastal plains, particularly where acacia trees, one of their staples, grow. 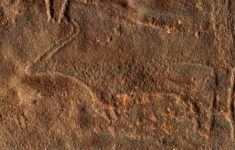 It is less well adapted to the more arid deserts than the Saudi Gazelle, which probably replaced it in areas that became significantly drier at the end of the Holocene Wet Phase. 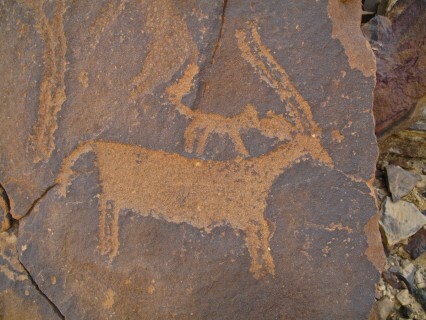 The Mountain Gazelle still inhabits the western mountain ranges and the northern part of mainland Saudi Arabia. 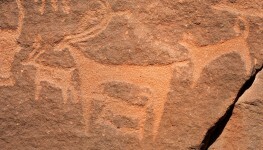 This subspecies of the Dorcas Gazelle is now extinct in Saudi Arabia, although there are other subspecies elsewhere. It is a small gazelle with a pale reddish coat that has more muted patterns than the Mountain Gazelle. It also has longer and straighter horns that do not diverge as much, are not lyrate (lyre-shaped), and curve only slightly at the tips. 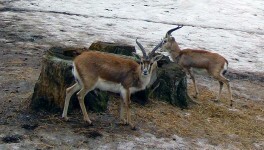 The horns, found in both sexes, have more annular ridges than those of the Mountain Gazelle. 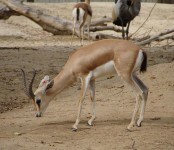 The Dorcas Gazelle has a black spot on the nose, long ears, short legs, knee tufts, and a short black tail. 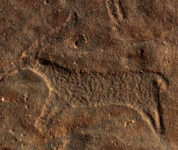 This species prefers gravel plains where Acacia grows, such as those east of the Hejaz Mountains, and, to a lesser extent, the sand desert. The Saudi Gazelle’s distribution once extended from Kuwait and Jordan through North and Central Arabia, along the western margins, around the fringe of the Rub al Khali to Yemen, but not in the southeastern part of the Peninsula. The Sand Gazelle is as large or larger than the Mountain Gazelle, and more robustly built. The body is pale-colored and the facial and body markings are usually not prevalent, with the exception of a white nose spot. The male has long horns that diverge at the tips and are strongly lyrate. The horns of females are long and slender or absent. The males have a goiter-like swelling on their neck during the breeding season, which is why the species is known as the Goitered Gazelle. They have a dark tail of medium-length that they hold upright when they trot. The Sand Gazelle prefers open sandy deserts, which explains its light coloration and lack of distinct stripes. The Sand Gazelle is found in the Nafud desert of northern Saudi Arabia today.